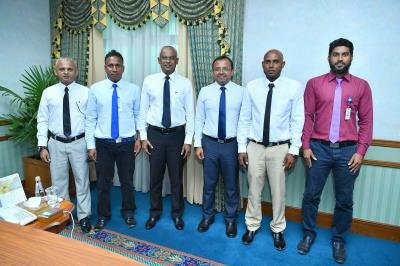 President Ibrahim Mohamed Solih has this afternoon met with members of the Kolhumadulu Atoll Council. At the meeting held at the President’s Office this afternoon, members of the council briefed the President on the most urgent needs of the atoll’s citizen, and the council’s plans for the further development and economic progress of the atoll. Council members also highlighted that the people of the Kolhumadulu Atoll were highly expectant of the development of tourist resorts in the atoll. Speaking at today’s meeting, President Solih reiterated that the administration continues to identify the most pressing needs of the people, and ways to best resolve the issues. He also highlighted on the administration’s development plan and noted that extending the tourism industry to all parts of the country was one of the highest priorities of the administration.